For some of the most stunning Asheville wedding venues in the area, check out the multiple event spaces available at The Horse Shoe Farm. Just ten minutes away from the Asheville Regional Airport sits over eighty acres of pristine pasture and riverfront farmland. Surrounded by the Southern Appalachians, The Horse Shoe Farm is an enchanting escape from bustling city life. But it is still just a short drive away from downtown Asheville. Picturesque white fencing runs throughout the property, sectioning off pastures and run-ins for the equestrian facilities. The historic French Broad River borders the property, which boasts a natural beauty unrivaled by other Asheville wedding venues. The Horse Shoe Farm offers two all-inclusive wedding packages for couples looking to exchange vows at the farm. Our Civil Ceremonies package includes use of the entire grounds for the day of the event, which can accommodate up to 500 guests. Couples are also granted use of one of our climate-controlled indoor event venues: The Big Sky Barn, The Sunset Barn or The Stable House. On-site parking is available, and our staff can assist with coordination and delivery of rental equipment. Our Exclusive Package encompasses all the amenities in the Civil Ceremonies option, but also includes use of all guest homes for three days and two nights. This package is especially popular among weddings that will be attended by out of town guests. 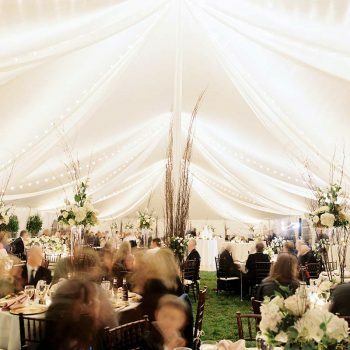 Large wedding parties also enjoy the convenience of staying just a few feet away from the ceremony space. Our luxury homes can easily be turned into bridal suites to accommodate hair and makeup services. Not many Asheville wedding venues can offer luxury lodging just steps away from the ceremony and reception sites! 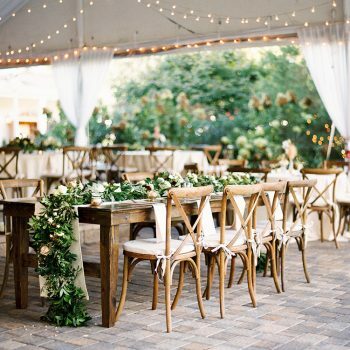 If an outdoor ceremony isn’t your style, choose from a selection of our climate-controlled indoor event venues. The Big Sky Barn and The Sunset Barn each have 6,000 square feet of usable space you can transform for your big day. The Sunset Barn also has a dividing wall, so you can separate the room into two spaces. Transition seamlessly from cocktails to dinner or ceremony to reception, all without missing a beat. The Horse Shoe Farm also offers catering services through their residential restaurant, The Silo Cookhouse. Sample from our divine offerings and let us take care of the menu. With so many inclusive amenities and stunning views within one convenient location, The Horse Shoe Farm puts other Asheville wedding venues to shame. Contact us today to begin planning your event.